Currently on test in Osaka, the ‘Robot Locator’ system from Network Security Japan (NSJ) is intended to showcase the company’s location technology and its ability to provide a rapid response to dangerous situations faced by its customers. NSJ’s squadron of bicycle-pushing security staff patrol part of Osaka known as America Village waiting for an alert from their control room in response to a customer setting off an alarm in the form of a small IC tag they have been issued with. The tag sends a signal to the nearest of 30 vending machines that dot the streets of the area, which then uses GPS to pinpoint the source of the alarm, before calling in the location. The idea is that the closest security guard pedals to the rescue with guidance from NSJ Central. 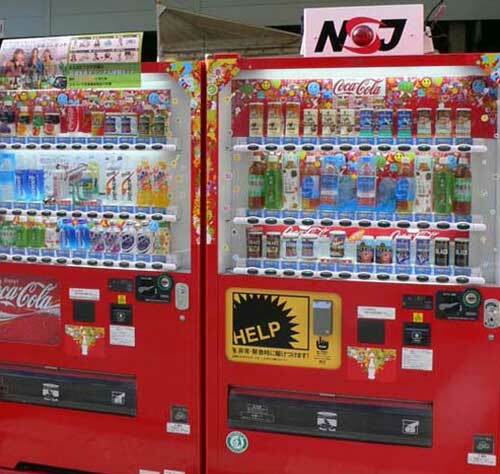 This can be done even if the customer is forced to move, as the network of vending machines covers a wide area. Anyone who isn’t an NSJ customer can also benefit from the service if they can find one of the networked machines in time and press the alert button mounted on the front of each one. As America Village is popular with tourists and school-trip parties, NSJ sees it as an ideal opportunity to put its services in the shop window.